According to Ayurveda, good health is dependent upon our capability to fully digest and elimate food as well as process information taken in by our 5 senses. Any Ayurvedic detox should involve boosting our digestion, known as ‘agni’ in Ayurveda, as well as restoring our senses. When this digestive capacity, know an ‘agni’ is balanced, we create healthy tissues, eliminate waste products efficiently and produce a subtle essence called ‘ojas’. This is the basis of physical and emotional strength, and immunity and is key to feeling full of life. On the other hand, if our agni is weakened, digestion is incomplete. This accumulation of toxic residue is collectively known as ‘ama’. Ama is the accumulation of toxins in the body from improperly digested food or waste materials in the body. This substance is heavy, dense, cold, and slimy and blocks energy flows, leading to obstructed nourishment and disease. Ama is the root of most colds, fevers and flu, as well as the chronic diseases of a weak auto-immune system which may range from allergies and hay fever to asthma, arthritis, or cancer. Other symptoms that can be improved by a short detox are headaches, brain fog/poor concentration, fatigue, joint pain, muscle aches and pain, and skin problems such as acne or eczema. By removing ama from the body and mind we bring a higher state of being to our lives. But its not just the right diet that is so important as negative emotions (fear, anger, greed, and guilt) also create mental toxins. These are as damaging as their physical counterparts and obstruct the flow of positive feelings and mental clarity, and lead to mental imbalance. Undigested experiences become toxic like undigested food. So, its not just what we eat, but how we feel when we eat it! Furthermore, our 5 senses our often overused or underused, such as excess staring at screens, or standing by the speakers at a night club! So, do you think you might have ama, after the long Winter? Symptoms of ama in the body include: loss of taste and appetite, indigestion, tongue-coating, bad breath, loss of strength, heaviness, lethargy, and obstruction of channels (eg: constipation) and vessels in the body, with accumulation of waste-material, bad body odour including urine or feces, lack of attention, loss of clarity, depression, or irritability. Detoxification is a natural body process to reduce ama. It is, however, compromised when our system becomes overloaded from a variety of causes that include poor diet, allergies, stress, infections, and toxins such as heavy metals. So what can we do to support the body’s natural process of detoxification at this time of year? Panchakarma is an ancient form of Ayurvedic purification which removes ‘ama’. By cleansing and detoxifying the body, it also helps build the natural fire within the body, or ‘agni’, which itself naturally burns ama from the body. It is the ultimate mind body detoxifying experience, though it takes time (3 weeks minimum), can be expensive (though is cheaper in India) and is not for the faint hearted! 1. For a week, eat foods that are easy to digest such as vegetable juices made with some ginger, vegetable soup, steamed vegetables and rice (pref brown and short grain as this helps draw toxins out). Avoid potatoes, tomatoes, peppers, aubergine (members of the nightshade family which are less beneficial for the body and also harder to digest) as well as salads and raw food beyond juices. 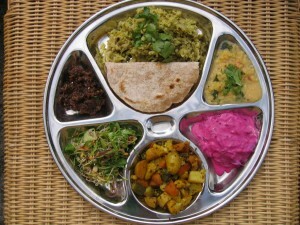 Kitchadi is ideal- see Recipes page on my web-site. 2. To help the body digest food, use ghee (See Recipes), fresh ginger, cumin, fennel seeds, coriander, turmeric, garlic, black pepper and cinnamon- basically all ‘warming’ spices will act like a medicine to break the heavy, cold, sticky ama and boost the digestive fire (agni). All food should really be considered as medicine for the body. 3. Drink water at room temperature, along with herbal teas, especially those with the above herbs. You can make your own teas by grating and crushing these herbs in hot water, leaving for 5 minutes the strain and serve eg: fennel and cumin and ginger. 5. Take herbal remedies to help digest ama after each meal, such as Trikatu and Triphala. Also Aloe Vera juice. Triphala is the most famous Ayurvedic formula. Its a mixture of three fruits (Amla, Haritaki and Bibhitaki) and is used to cleanse the whole system by regulating the bowels. Triphala is the best natural herbal remedy for sluggishness and regulating the whole digestive system. Amla has one of the highest Vitamin C contents in the plant kingdom and helps regulate the liver. Haritaki means ‘remover of disease’ and helps promote the bowel and tone intestinal muscles. Bihitaki helps maintain healthy mucus membranes. This is a very good remedy for everyone and a good laxative for stubborn constipation as it is safe for long term use. Its balanced spectrum of 5 tastes can be used to reduce food cravings and prevent over eating. Dosage for the detox: Take ½ tsp 3 times a day with food or one teaspoon at night with warm water to detox the bowel. To take this way, add Triphala to a cup of boiling water and steep for 10 minutes. Drink the liquid when cool enough to drink, leaving the loose herb at the bottom of the cup. As your health improves, the taste will become less bitter! If the taste is really unbearable, you can take with honey. Exercise caution in pregnancy (can be taken as part of a formula as a general tonic). Trikatu means the ‘three pungents’ and is made from Ginger, Black Pepper and Long Pepper. It is traditionally used for lung and nasal problems with the hot spices drying excessive mucus production. Trikatu is also used as a food supplement to help maintain healthy respiratory, digestive and circulatory systems. It is used in Ayurveda as part of a weight loss regime to increase metabolism, digest fats (and LDL cholesterol) and ‘ama’ (undigested matter) and balance appetite. It is traditionally taken with honey. Dosage for the detox: Take ½ teaspoon after brunch and dinner to aid digestion and digest ama. Don’t use with hyperacidity, ulcers, with signs of aggravated Pitta (heat) in the body or in pregnancy. Aloe Vera Juice is a food supplement made from the pure inner gel and without synthetic preservatives. Aloe Vera is a naturally cooling and nourishing plant renowned for maintaining youthful looks, healthy skin and balanced digestion. It clears inflammatory heat from the body, whilst supporting gentle detoxification of the liver. It has been used for thousands of years for its healing properties and is one of Ayurveda’s most potent cleansing and rejuvenating elixirs. Aloe Vera is an amazing versatile plant – it truly is nature at its finest. Dosage for the detox: Take 1-2 tablespoons every morning on an empty stomach for a cleansing and nourishing start to the day. Don’t use in pregnancy. 6. If you are prone to constipation (due to Vata imbalance or nature) take a teaspoon of castor oil with a pinch of dry ginger in a glass of hot water at night. This will cleans the colon and restore the proper flow of Vata through the body’s channels. The Triphala should also help ease the bowel. 7. Get plenty of rest, with yoga, meditation or other mind/ both integration techniques to help detox the mind as well as the body (remembering both are linked and will affect the other!) Negative thought patterns, stress and emotions can all lead to the build up of ama, as well as eating a poor diet, as they affect how the body digests food. As far as resting and restoring the senses, you may like to start using a tonguescraper (taste); going on a media fast for a week with no TV, newspapers, or radio (to rest the eyes, ears and mind); and using a neti pot to cleanse the nose. You can tell that ama is being digested as at the end of the week, you will feel lighter, your mind and senses more alert and active. Once the week is over, continue to follow a diet that suits your dosha, eating lightly for another few days until your digestion has had a chance to recover from the cleanse. For more information on how to detox the Ayurvedic way, I’d recommend the excellent Teach Yourself Ayurveda book by Sarah Lie.